Audials Music Zoom is a free software to stream music from various popular music services like SoundCloud, Vimeo, DailyMotion, etc. Using this software, you will be able to stream and listen to music albums of more than 300K music artists including your favorite Coldplay, Ed Sheeran, Rihanna, Justin Bieber, Ariana Grande, DJ Khaled, and so on. It automatically scans through hundreds of radio stations all around the world to find and bring the best music for you. You can seamlessly discover and listen to thousands of songs using the built-in media player. Unlike other music streaming services, Audials Music Zoom exhibits 1000+ music genres from which you can browse your favorite songs and stream them for free. Some of the genres which you may like are Blues, Hip Hop, Rap, Indie, Reggae, Classical, Jazz, and much more. It even comes with a “Genre Galaxy” which allows you to easily find artists of different genres just by zooming into the galaxy and listen to their music without much effort. Before you start, simply download and install Audials Music Zoom on your PC. The download link is provided at the end of this post. After you do that, open up the software and you will see the media player section on the left of the window. 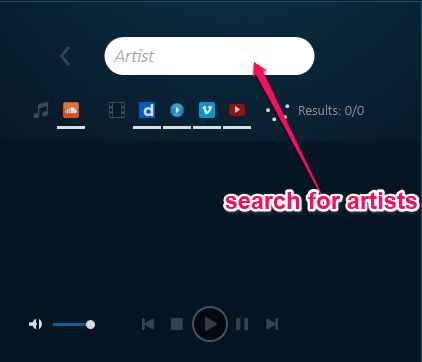 On this section, you will see a search bar using which you can search for artists to stream their songs. When you type the name of any artist, it will show the artist profile and you can click on it to proceed. Once you do that, it will open up all the albums and single music tracks of that particular artists. It will basically fetch the songs from SoundCloud, Vimeo, DailyMotion, Veoh, etc. and allow you to stream. You can click on any songs you want and listen to it using the built-in music player of this music streaming software. 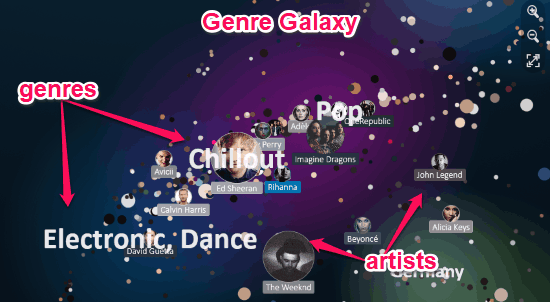 In addition to using the search bar for finding and streaming music, you can also use the “Genre Galaxy”. It will be visible on the right of the window and you will see various music genre on the galaxy. Currently, it supports tons of genres including Blues, Hip Hop, Electronic, Pop, Reggae, Indie, Gothic, Latin, and more. 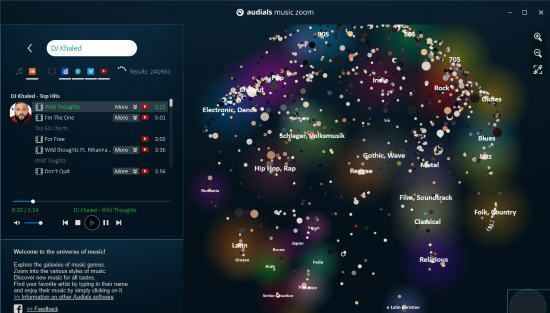 When you zoom into the galaxy, you will be able to see all the popular artists of associated with each genre. You can click on any of the artist’s names in the galaxy and stream his/her songs. Audials Music Zoom is a pretty simple yet useful music streaming software which helps you easily listen to thousands of songs completely free. Name your favorite genre or artist, you will probably get it on Audials Music Zoom for sure. You can only use it to stream music and not download. But, if you’re looking for a way to download your favorite songs from let’s say SoundCloud, then check out this post How To Download Songs From SoundCloud. Get “Audials Music Zoom” from here.